The Lucca Film Festival will take place October 5-9 2010 at the Cinema Central and the Auditorium San Romano in the center of Lucca. The festival, now in in its sixth year, has as main purpose to promote exciting new works by artists from around the world, encouraging their knowledge and dissemination, whilst trying to rediscover and show 'historic' works that marked the path of art film, as a meeting point between past and present. The competition is divided into three sections: fiction, documentary, experimental. - Short films must not exceed 29 minutes. - Productions on the following screening formats are accepted: 16mm, 35mm, Beta SP, Beta Num, DigiBeta, DVD, DV, Mini-DV, Mini DVCam. - If the film is neither spoken nor subtitled in Italian, it is required tio send a copy (paper or digital) of the dialogues preferably in English, to allow subtitling of all films. The films sent for preselection must be submitted in DVD media. Label the items as specified: title, section, director, and duration. Please send a CD / DVD containing two high quality photos for publication in the catalogue. The material sent for pre-selection will not be returned. The films must be sent - in 2 copies - by July 31, 2010, together with the registration form. It is required the payment of 10 Euros for the costs of the secretariat for each parcel sent. Payment must be made simultaneously with the sending of the material. Please enter as the reason for the transfer your name and the word "competition". It is also possible to pay by credit POSTEPAY. In this case, please send an email on segreteria.lff @ gmail.com to have the data required for payment. After last year's edition, with retrospectives on Stephen Dwoskin and Kenneth Anger, the 2007 edition of the Lucca Film Festival will feature a complete retrospective of the work of Michael Snow. Along with the film restrospective that will be shown at the cinema festival, there will be a retrospective featuring thirteen of his projection works and videoinstallations at the Ragghianti Foundation, Lucca, from 29 September to 4 November 2007. The festival will also feature two more retrospectives on the films of Guy Debord and Aldo Tambellini. 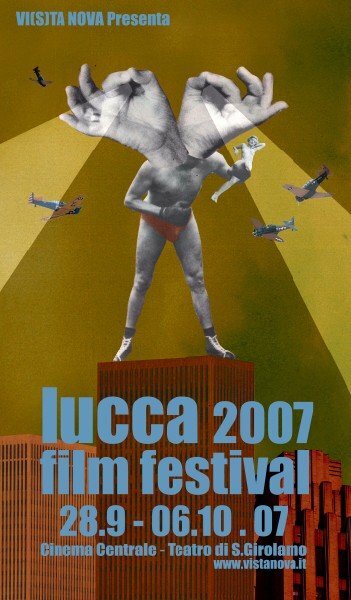 The LFF 2007 edition will be held from September 28th to October 6th at the city of Lucca , Italy.